Coburg is a suburb 8 km north of central Melbourne, extending north from Moreland Road, Brunswick, to Gaffney Street, Coburg North. Its central spine is Sydney Road. Coburg city had Moreland Road as its southern boundary and extended north to Boundary Road, Fawkner. Its western boundary was the Moonee Ponds Creek and Northumberland Road, and its eastern boundary was the Merri Creek and a line prolonged from the east side of the Coburg cemetery. The boundary creeks partly explain the subdivision of the area into farm allotments in 1840, with a village reserve east of Sydney Road, south of where Edgars Creek joins the Merri Creek. Most allotments were surveyed so as to have water access. The village did not come to much: named Pentridge, no particularly convincing case has been made out for the origin of the name. Its fate was sealed when part of it was taken for a penal stockade in 1850. Nevertheless, farm settlers succeeded in getting village land grants for churches. The Wesleyan chapel (still standing) was built in 1849, and Anglican and Catholic churches were built by 1850. The replacement buildings and the original chapel now constitute an ecclesiastical precinct at the corner of Sydney Road and Bell Street. When the Wesleyan chapel was built there were about 20 farms in the area. A distant one, La Rose, to the west near the Moonee Ponds Creek, included a homestead (1842). It also still stands, and is heritage listed. Farms gave way to bluestone quarrying, and a District Road Board was formed in 1859. Part of its task was to build bridges over the Merri Creek at Bell Street (1857) and Newlands Road (1865). Pentridge Road Board was renamed Coburg in 1869 and became a shire in 1874. Its area was 19.4 sq km. The Pentridge stockade name was readily discarded when a prominent local merchant, Robert Mailer, suggested that the Duke of Edinburgh's forthcoming visit to Australia should be honoured; the Duke was a member of the royal house of Saxe-Coburg. The Road Board built an office east of the ecclesiastical precinct and the site was used for the later town hall and council chambers. Sydney Road was Coburg's high street, with a horse tram service (1889) and a railway line about 200 metres to the west. Coburg railway station was built in 1888. Urbanisation hugged the Sydney Road and railway corridor. Land boom subdivisions cut up the farms in the 1880s, but subdivided paddocks full of thistles littered the landscape until after World War I. The unsubdivided Newlands area north of Bell Street was farmed until after World War II. Two years later Coburg became a borough, in 1912 a town and in 1922 a city. Soon after achieving town status, Coburg's new high school was opened in 1916 and the Sydney Road tram was electrified. Some of the land boom house allotments were built on, and the localities of Coburg West and Coburg East were established. Their State primary schools opened in 1917 and 1926 respectively, and the Melville Road tram in Coburg West was extended to Bell Street in 1927. Coburg also had large land parcels for industry: Lincoln Knitting Mill, Gaffney Street (1911-80); Moreland Knitting Mill, Moreland Road (1920) and Beau Monde hosiery mill (1930). Coburg North also opened up, including its new locality of Merlynston with a State school opening in 1928. The Coburg West progress association (1917) built a hall in Reynard Street in 1923 which became the local picture theatre. Further west there is Pascoe Vale, positioned on a railway line and touted by the Coburg City Council (1922) as the garden suburb of the north. The 1920s were a boom time for Coburg's residential growth. Suburbanites needed recreational space. The Lake Reserve along the Merri Creek was acquired by the Council in 1912 and downstream the De Chene reserve (named after a Labor councillor) was laid out in 1924. Despite Pentridge's grim reputation, Coburg yearned for higher things. In 1944 and 1946 it held arts festivals with brass bands, vocal and choral recitals, opera, ballet, drama, symphony concerts and an art show. The artists' names on paintings now read like a canon of Australian art. 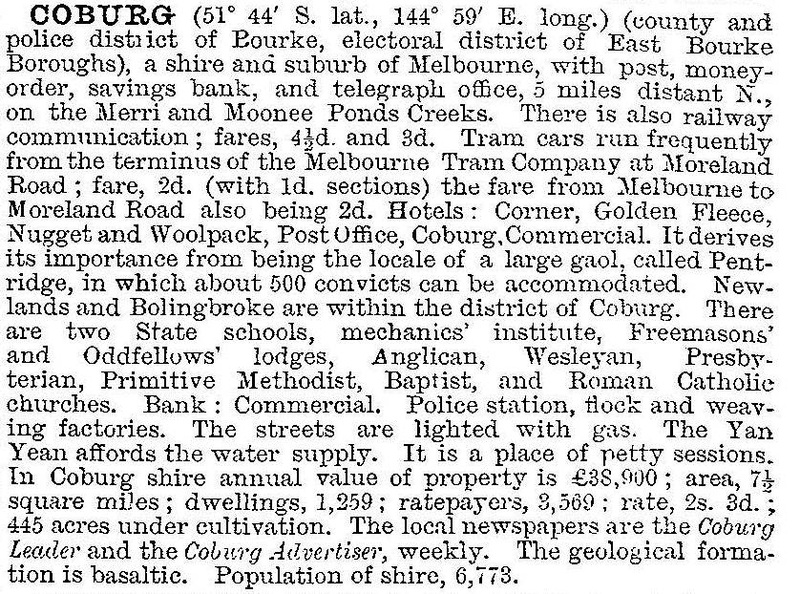 Within 12 years another 20,000 people resided in Coburg city. The housing boom ended by 1960. The baby boom had kept the schools at capacity, and there were so many in and around Coburg that they provided a good training ground for trainees at the Coburg teachers' college (1959). The baby boomers also needed a technical school (1954-92) and entertainment at the Coburg drive-in theatre (1965), Coburg North. The first non-Anglo Australian mayor of Coburg was Salvatore (Sam) Gandolfo in 1968-69, but he came to Australia as a child in 1926. The Sydney Road shopping strip has not been menaced by a nearby large drive-in centre, but the closure of many textile factories by the 1980s wore down retail spending. Elderly people had nowhere else to go, but their spending was meagre; elderly non-Australians, however, still liked to gather in the main street. Later arrivals from the middle east had families and liked to patronise two dollar shops and ethnic bakeries. Coburg's last big housing estates have been Pentridge village (2000) on the decommissioned gaol and Newlands high school, and Coburg Hill (2011) on the former Kodak site (1961-2005). Presumably the inhabitants of these estates will have children. There are ample primary schools (except Coburg East which closed in 1996), but State secondary schooling in Coburg was restricted to the years 10-12 at Coburg senior school on the former teachers' college site. The senior school opened to Year 7 students in 2015 and was renamed Coburg high school. It would open to Year 8 and Year 9 as the original Year 7 students moved through. The original Coburg high school had closed in 1993, and the building stood as a derelict wreck for several years. Moreland council embarked on a very ambitious Coburg Plan, including the revitalisation of Sydney Road, but in 2011 terminated an agreement with the major development partner. In 1994 Coburg city was united with Brunswick city and parts of Broadmeadows city (Fawkner, Glenroy, Oak Park) to form Moreland city.